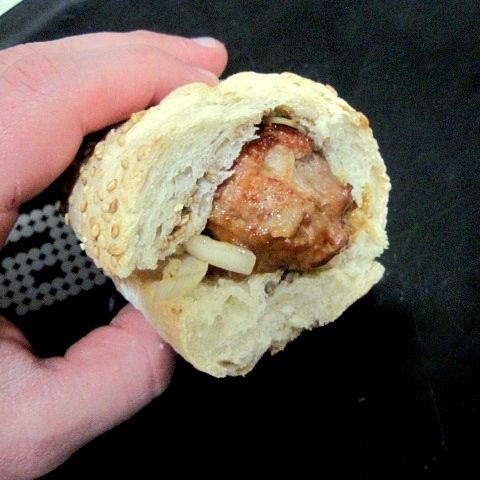 Just a quickie today kids but an essential one in my kitchen. 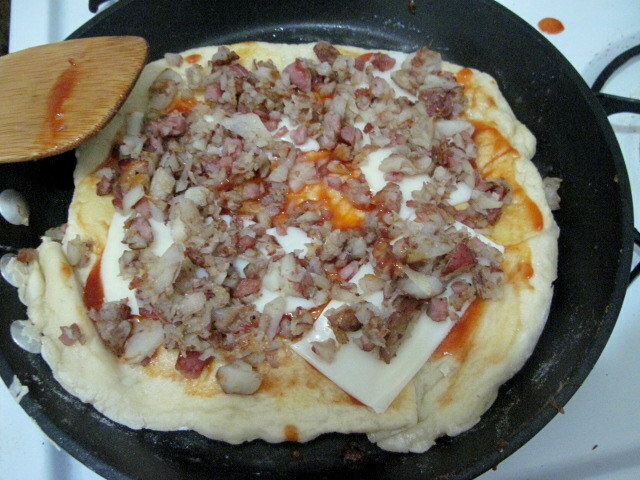 I make this flatbread constantly and use it for any sandwich I feel like. 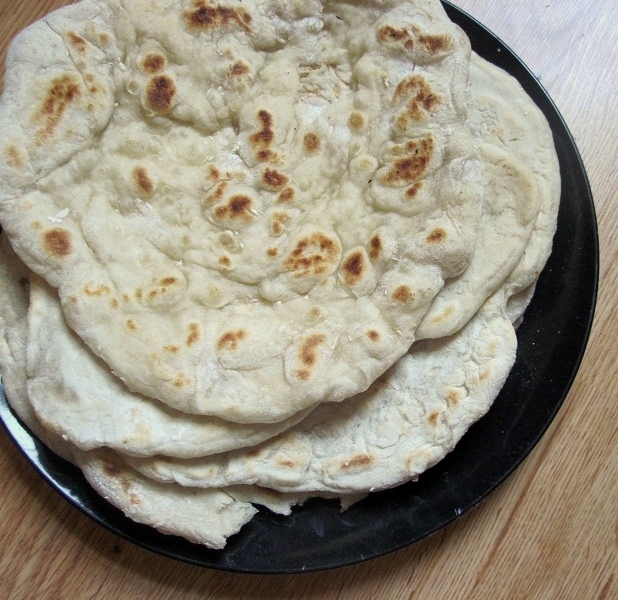 Sometimes I call it naan, but it’s not really naan since it’s made in a skillet. Whatever, it’s awesome. 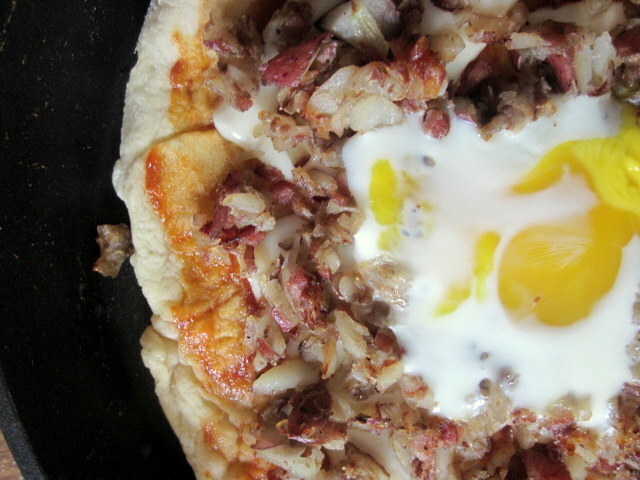 All you do is preheat a nonstick skillet over medium high heat, take a fistish sized chunk of bread dough (I use the Artisan Bread in 5 stuff), stretch it out like pizza dough and toss it in the skillet with a little butter, oil, bacon grease, whatever. Cover the pan and let it sit for ~3-4 minutes, then flip and re-cover. After a couple more minutes pull it out and that’s it. 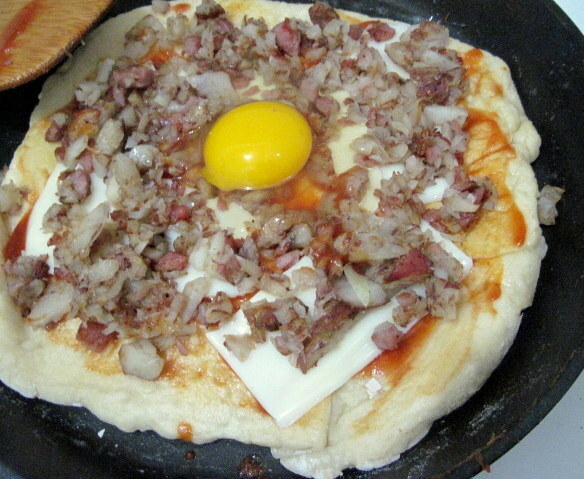 Flatbread. Eat it with stuff you enjoy. 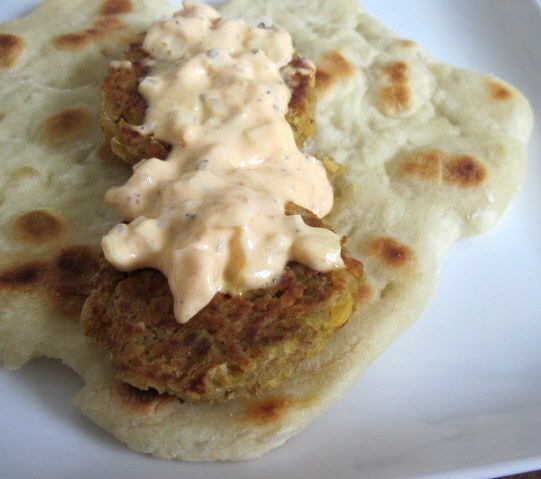 I love it with falafel which I’ll be posting about later this week since I have a recipe for it that freezes really well and is low fat but crunchy and awesome. 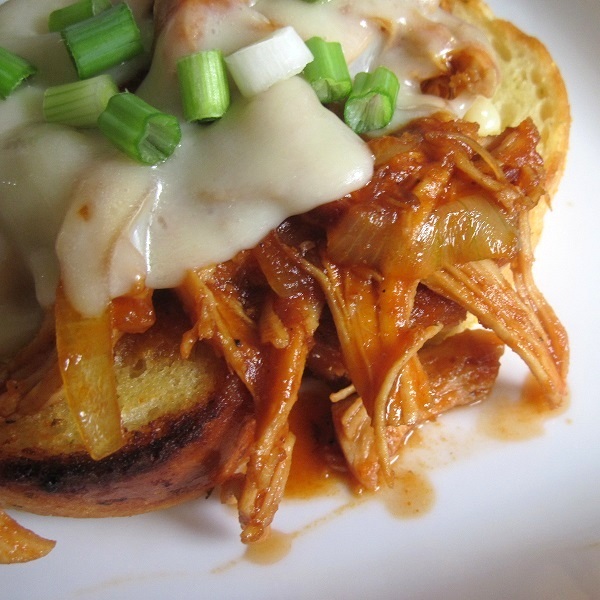 Here’s a quickie but a goodie and my new favorite thing to do with pulled chicken (or beef, pork or whatever). 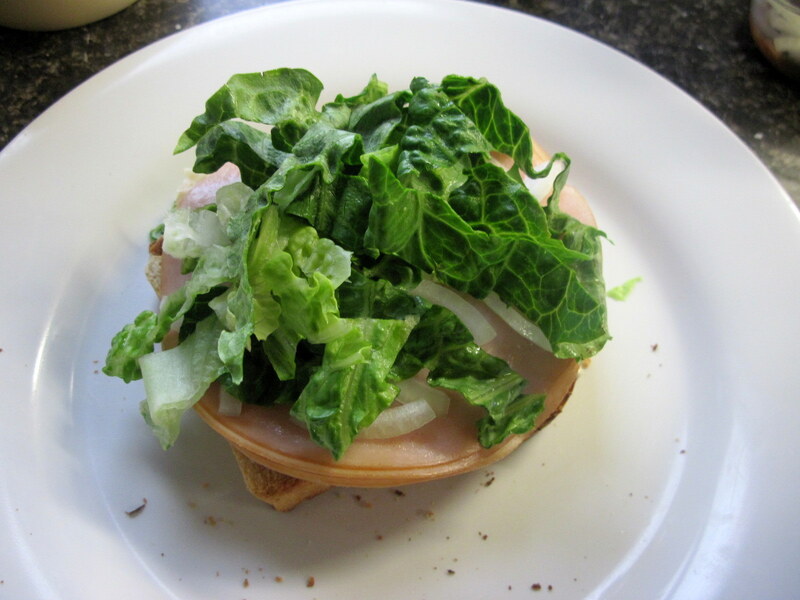 I didn’t used to like open face sandwiches and I still have a problem with the name, I mean if you can’t pick it up how is it a sandwich? But this totally won me over. 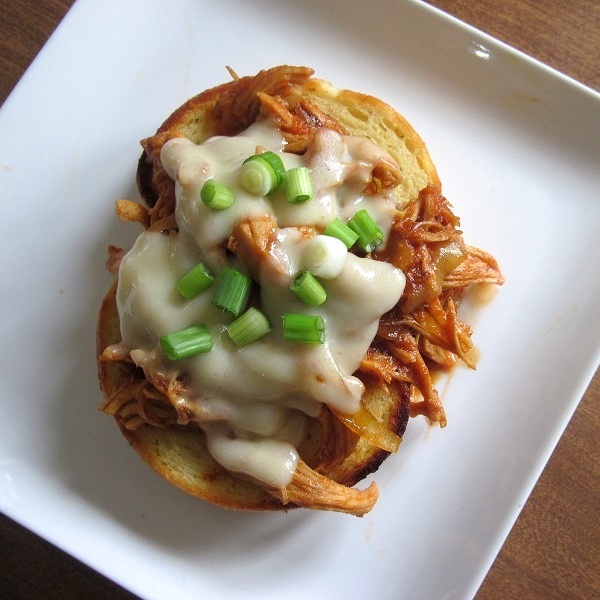 The secret, other than using good pulled chicken, is garlic bread. I like to use Texas toast (which you can buy loaves of here) because thin bread just can’t hang. 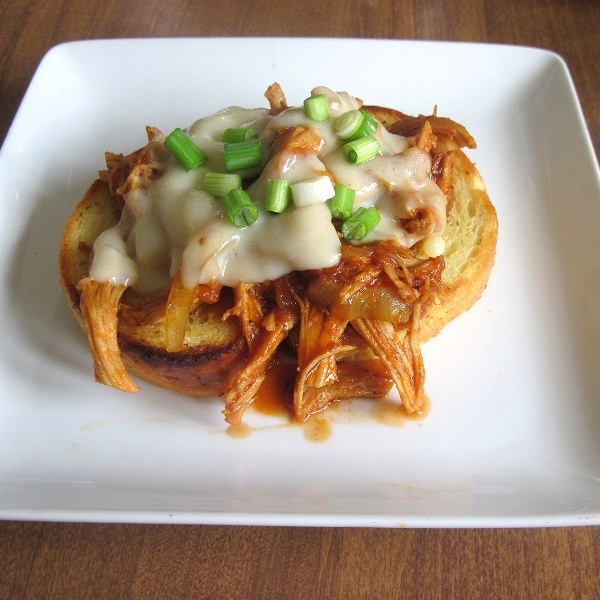 I use this pulled chicken although I have to admit to being a little embarrassed posting that link. Not just because it’s almost five years old and the pictures are terrible, but the method has certain flaws. For example you really don’t need to braise boneless skinless chicken breasts for an hour or more. 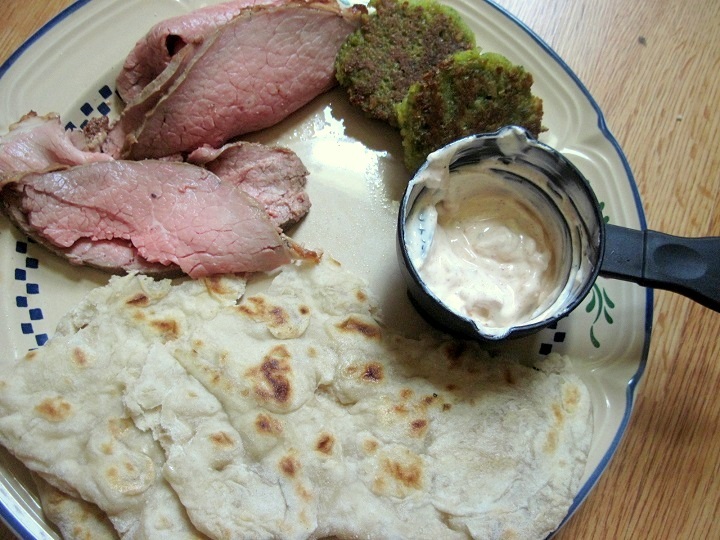 But what did I know, I was just starting at this blogging thing and still refining my cooking skills. Of course I’m still refining my skills, but that’s an endless journey. Heh. And anyway, the concept is sound, chicken, bacon and BBQ sauce are awesome together. They’re even better slathered on thick garlic bread with sauteed onions, covered in cheese, tossed in the oven for melting goodness and then topped with some scallion. Seriously. How can you not want to eat that wicked bad? Unless you’re a vegetarian, although I doubt I have too many of those following me. Heh. From “Beard on Bread” by James Beard. In the bowl of a mixer, combine oats and water; stir and let cool to warm (not too hot to kill yeast). 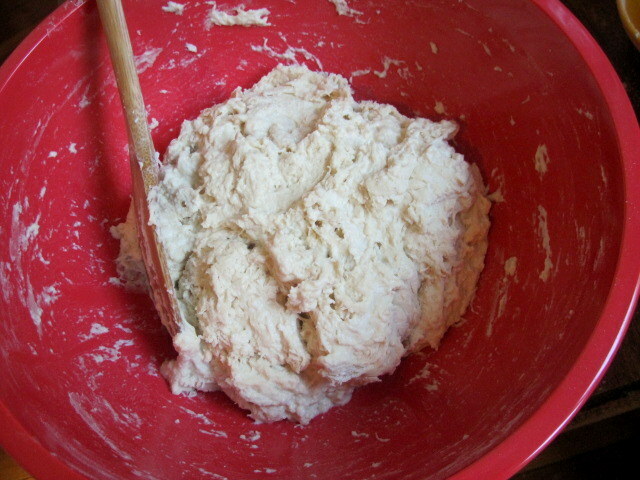 Stir in the yeast and 2 cups of the flour. Cover and let rise until double. Put the bread hook on the mixer. Add 4 cups flour, the salt, oil and honey and mix well. 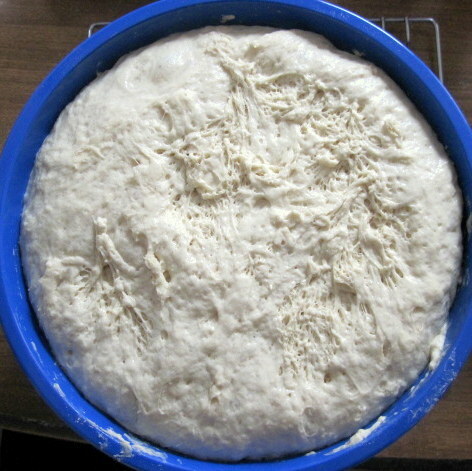 Continue to mix, adding flour as needed, to form a relatively soft dough. 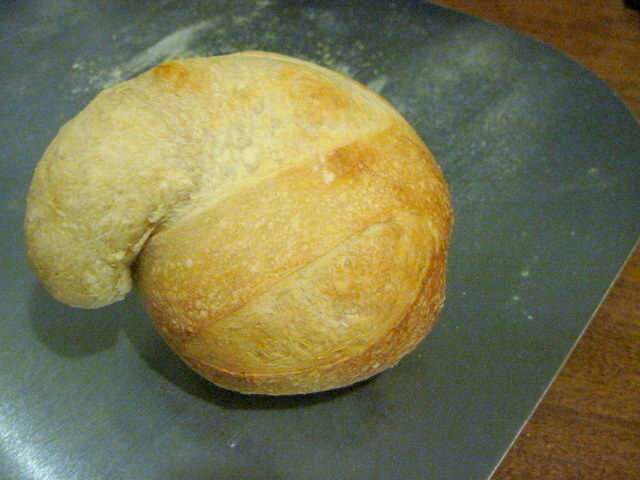 Knead 5 minutes or so. 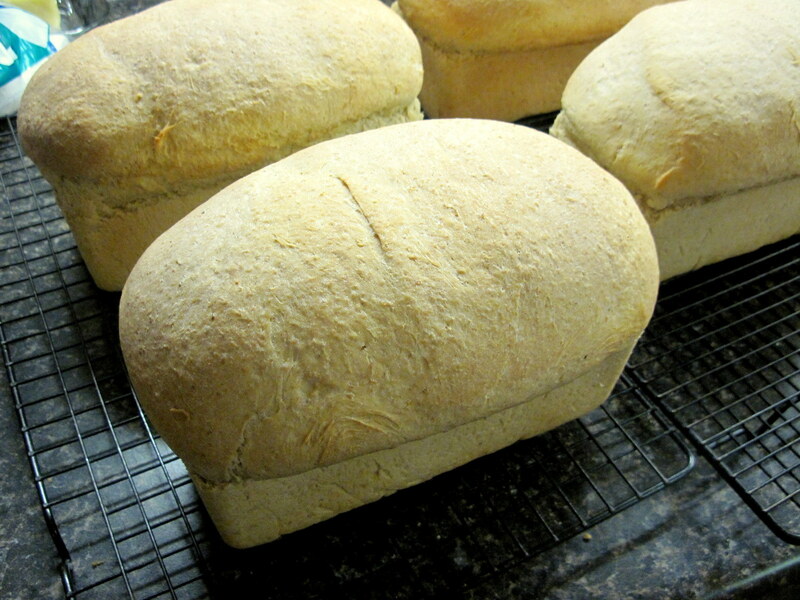 Shape into two large loaves (or four small ones) and place in greased pans. Let rise until double and bake at 350 until done. 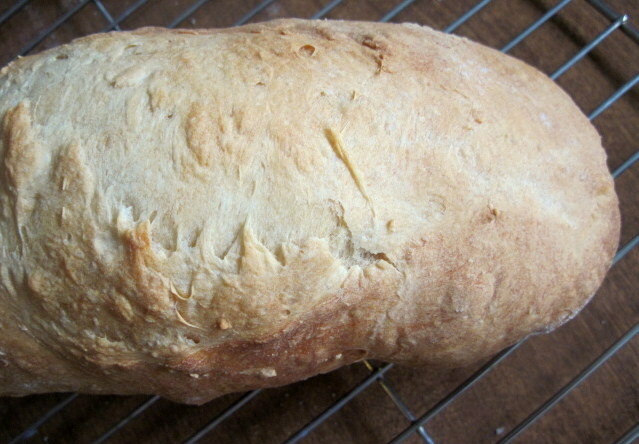 As I had promised here is the recipe for that oatmeal bread. 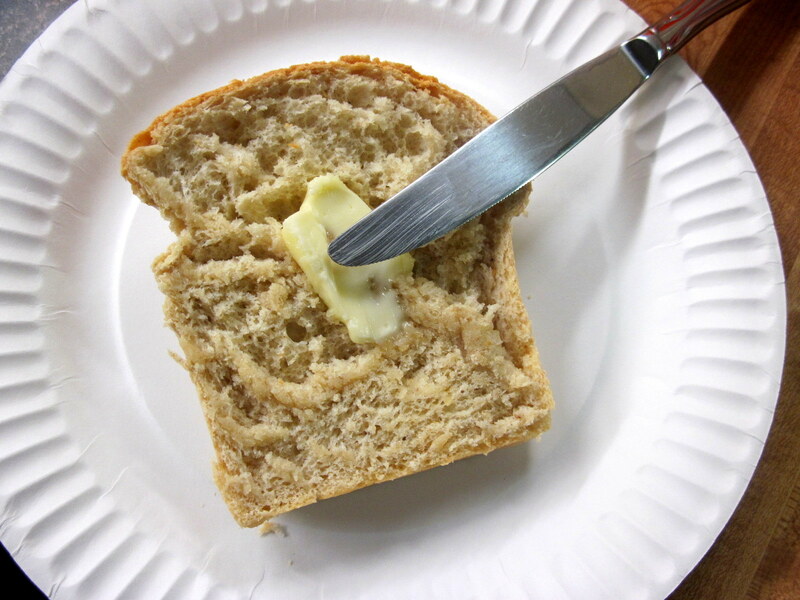 I have no pictures of the process, since my sister made it, but I do have a picture of a toasted slice with butter. 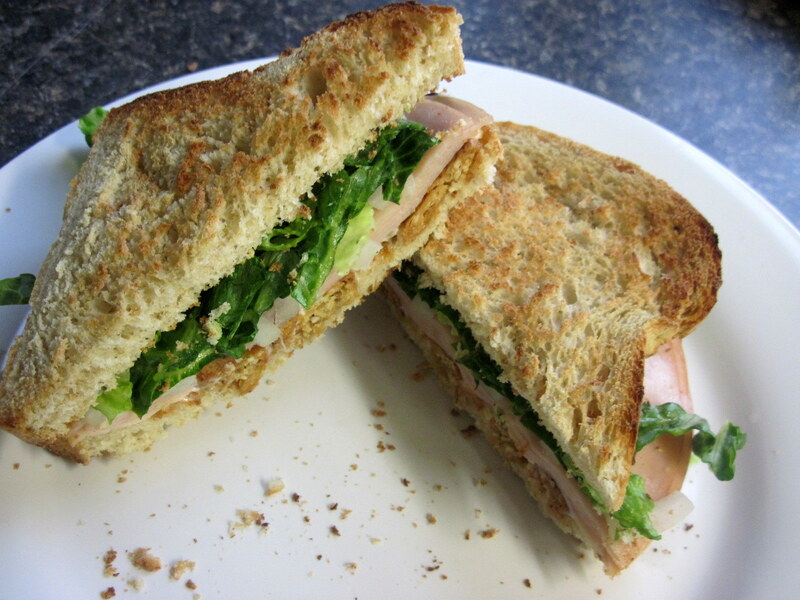 And while that is undeniably fantastic my favorite thing I did with it was a sandwich. 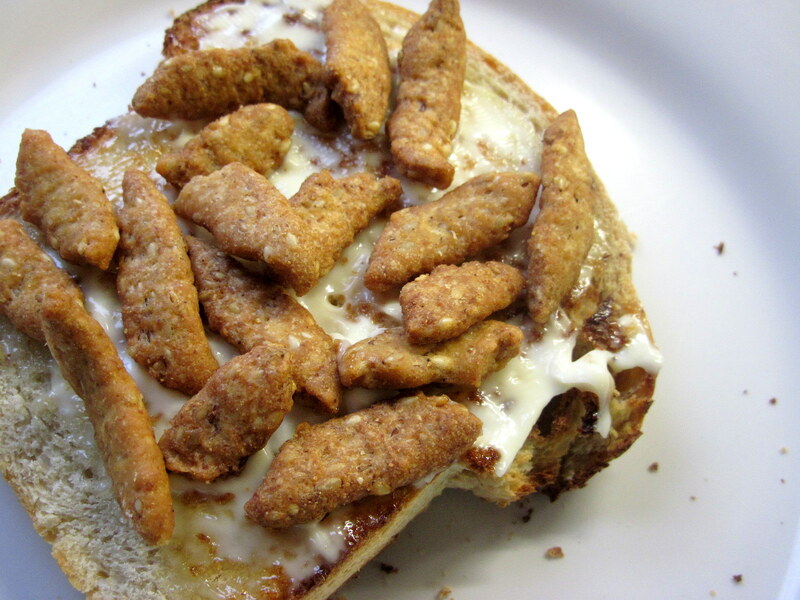 I took a couple slices, toasted, put some mayo and sesame sticks on it. The sesame sticks are a snacky thing that you can get at Trader Joe’s. Probably other places too, but that’s where I and my sis get them. 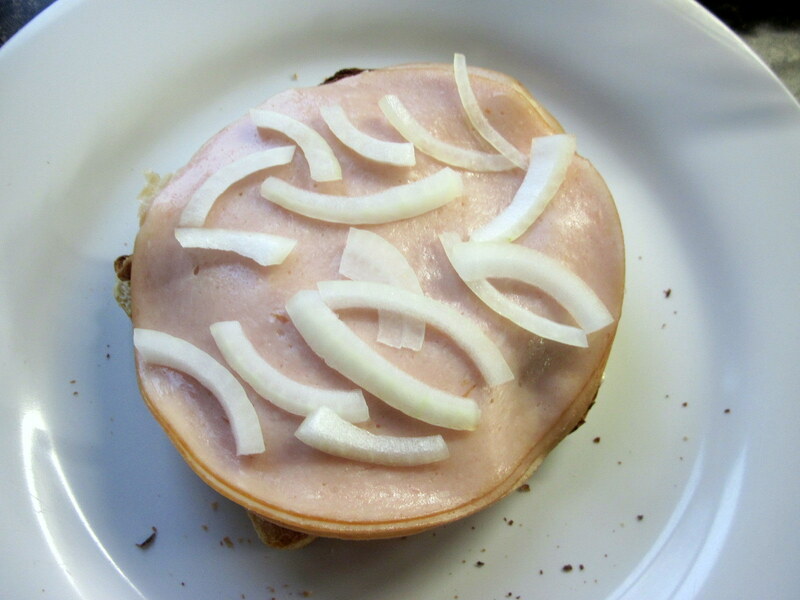 Anyway, then some turkey and onion. A bit of lettuce for health. So very good. 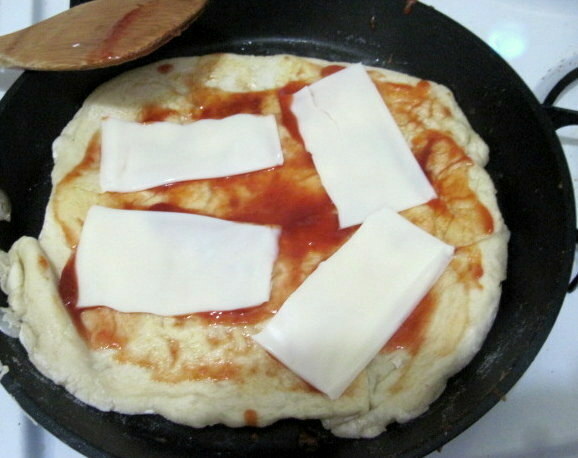 Would have been even better with some sriracha mixed into the mayonnaise, but for some reason I didn’t think of it. Which is odd since I put sriracha in pretty much everything… Ah well. Next time. And Now I’m in Iowa. With Children? …Really? This is strange to me, especially since it was so sudden, but especially because it’s Iowa. It’s not too bad though, everything is wicked cheap and hopefully there are some bored, lonely, corn-fed farm girls who would be delighted to be regaled with stories of the big city. But until I find out where they’re all hiding I guess I’ll just be cooking for me. Oh and my sister, her husband and five kids who live around the corner. Which is the real reason I’m here. Heh. 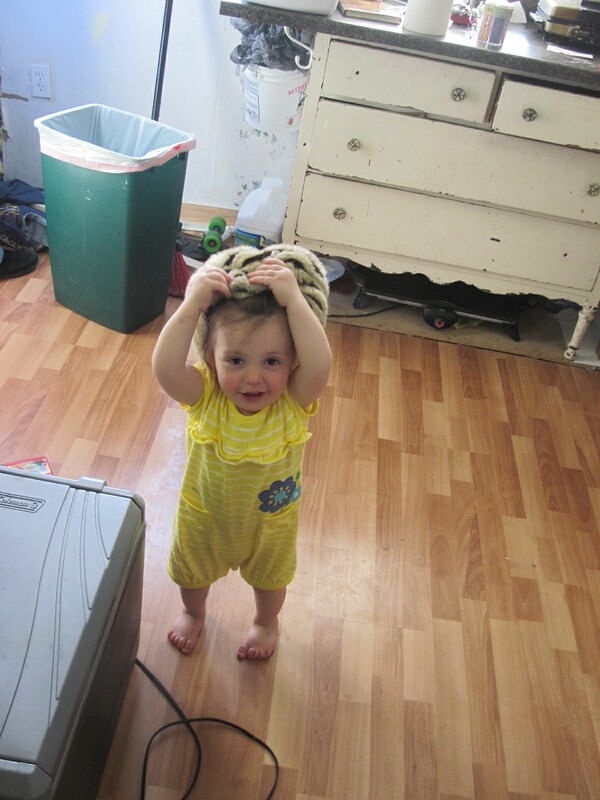 In fact, you’ve already met one of my nieces when she came to visit me a year or so ago. She’s a bit bigger and more entertaining now even if she still isn’t too sure of me. But this will pass, I’ve been bribing her with food. Oh right, food, that’s why you’re all here! Well, not much going on since I haven’t even gone real grocery shopping yet (something about living near my sister and her fridge full of kid friendly food I’m guessing). 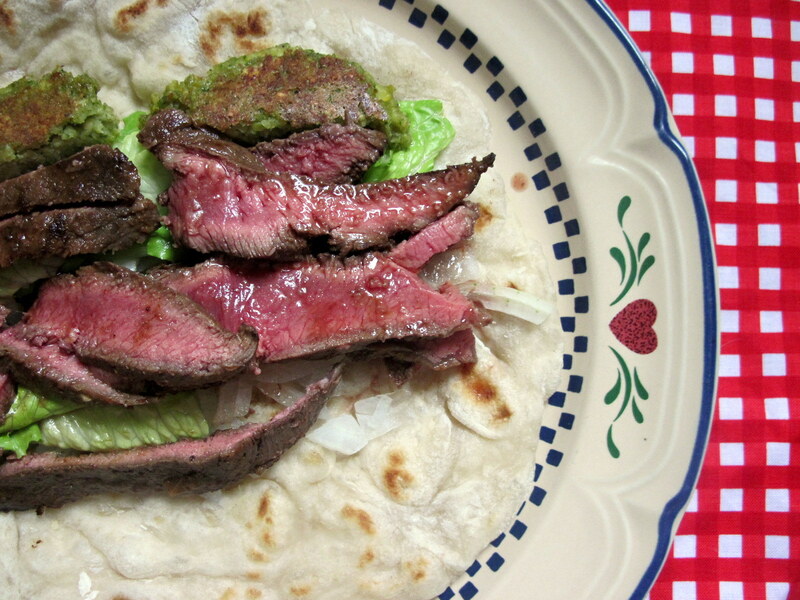 But here, this is the last thing I cooked in Lynn in that horrible, tiny kitchen. 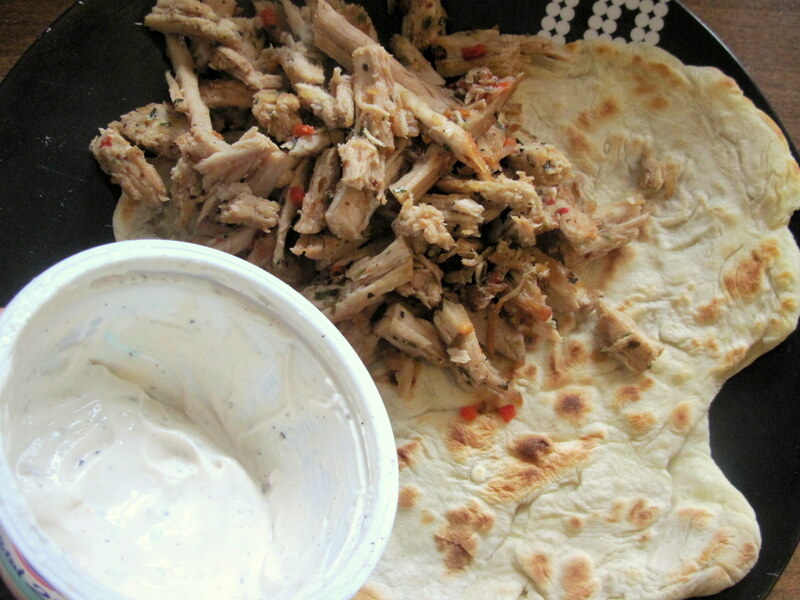 It’s braised shredded pork, naan and a red wine vinegar yogurt sauce. Good times. And my sister cooks too! 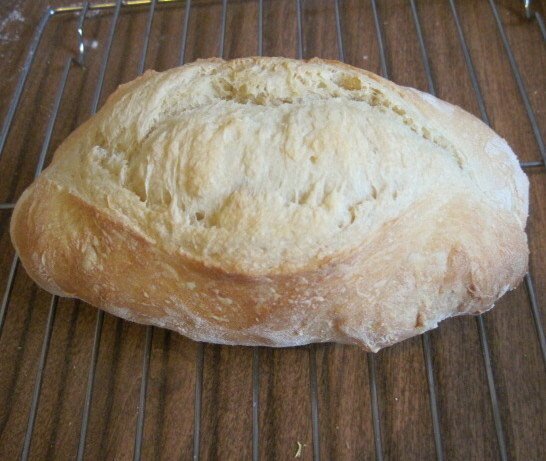 here is some amazing bread that she makes, I’ll post the recipe soon. 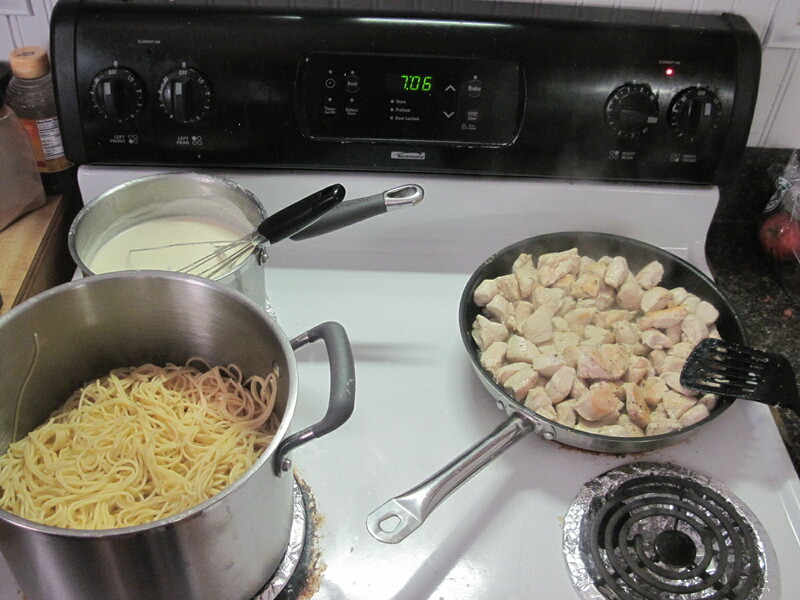 The first thing I cooked for them while I was saying at her house (it only took me a week to find an apartment and the contract was hand written of all the crazy things) I made chicken and pasta with a garlic white sauce and broccoli. They had to all be separate since some kids will eat some thing and not others, etc. It was good, but I’m not used to cooking for groups so it wasn’t as good as I wanted. And in case you were worried about the Real Bob put your fears to rest, he is fine. 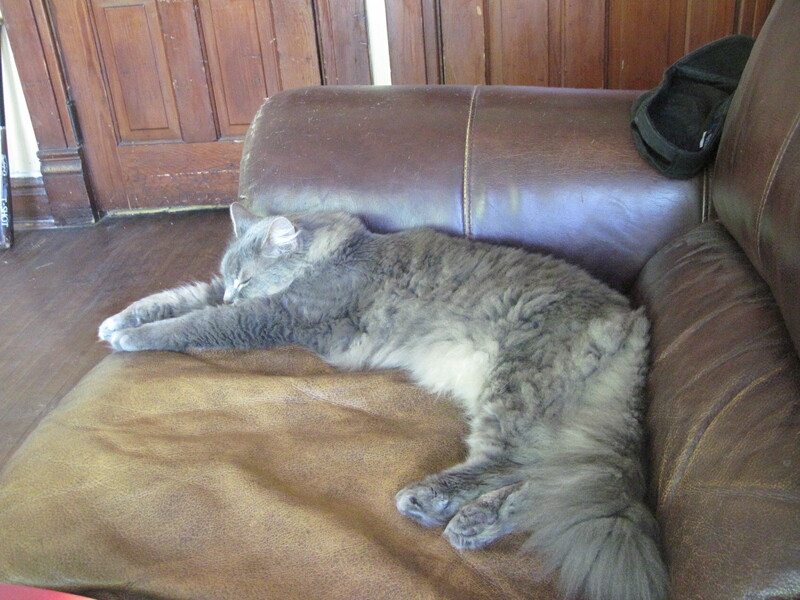 In fact he loves the leather couch that came with the apartment, but then so do I. Which is good since at the moment it’s also my bed. Heh. I’ll do a whole post about my new kitchen later, just wanted to check in and such. 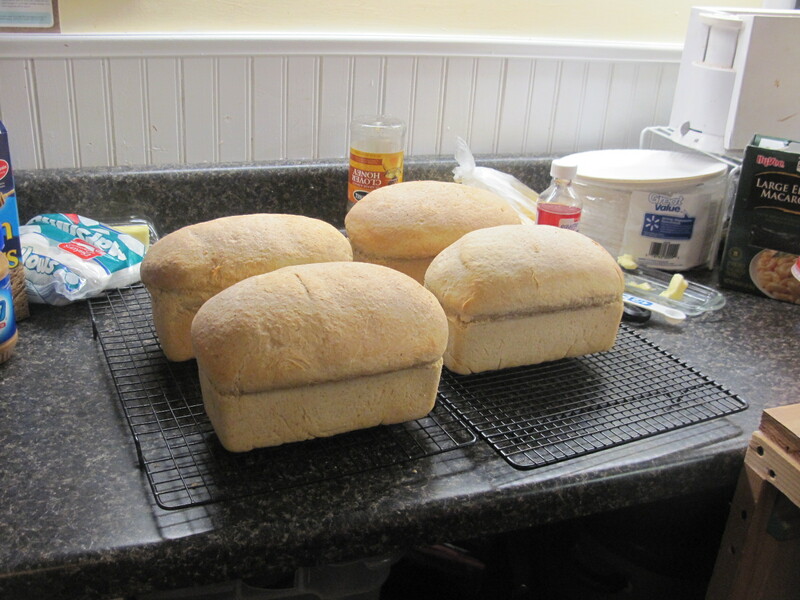 Still getting the hang of this whole WordPress thing, but I figured I’d take a minute to talk about bread. I love it. And ever since my lovely sister gave me a copy of Artisan Bread in 5 Minutes a Day I’ve been making it almost every day. It’s rather nice. You don’t knead the dough, you don’t worry too much about rising times and you get a killer product. 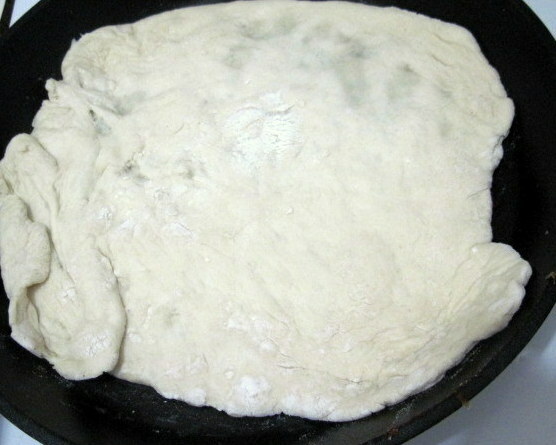 The weirdest part though is how wet the dough is. Here is a shot of it just mixed, doesn’t look right does it? But it is. And here is one after the only real rising time, two hours right after mixing. Uhm, they are pics from two different batches, just so you know. Anyway, at this point you keep it in the fridge for up to two weeks, pull off chunks whenever you want, let them rest a bit and then bake to your heart’s content. I’m still working on shaping skills, myself. Fortunately they all taste wicked good. With just the master recipe I’ve made baguettes, rolls, pizza, calzones, stuffed bread, foccacia and probably other things that I don’t remember. I can’t say enough good things about it, just ask anyone who has talked to me since Christmas. Seriously, I haven’t shut up.